As one of the activities planned to celebrate 76th birthday of the General Overseer, the Redeemed Christian Church of God (RCCG) worldwide, Pastor Enoch Adeboye, the nonstop 76 Hours International Marathon Messiah’s Praise (MMP) season 4, has been designed across 16 countries with 150 worship ministers across the countries, kicking off from the 26th of February to 1st of March 2018.
journalists at the RCCG camp recently said dedicating 76 hours Marathon Messiah Praise theme ‘The Great Redeemer’, has been schedule to praise God and to usher in a new pattern of worship will redefine the perspective of men to worship and praise in this dispensation, which will feature 100 thousand live participants, 10 million viewers in Nigeria. “As you all know, that the year will never pass by without us in the Redeemed Christian Church of God dedicating an overwhelming number of hours to praise The Great Redeemer for His mercies over our Daddy, Pastor E.A. Adeboye, The General Overseer, RCCG Worldwide, this year, we are dedicating 76 hours nonstop praises to God. From the year 2012 when God handed down the vision unto us, Marathon Messiah’s Praise has consistently thrilled the world while setting new records year-in-year-out. “76 Hours Marathon Messiah’s Praise, over 4,000 people have registered to volunteer in various departments including music, sanitation, welfare, medical and in other various key sections of the programme across the participating countries. Over 100,000 live participants are expected to be in attendance with over 10 million viewers expected to watch the event on TV and social media channels. “While the world is yet to recover from the awe that 74 Hours and 75 Hours displayed in the annals of musical history in the world, 76 Hours Marathon Messiah’s Praise is setting a new pace as it will be holding in about 16 countries across all the habitable continents of the world with the exception of South America. Countries that will be participating this year include Nigeria, United States of America, Canada, England, Australia, Spain, Scotland, United Arab Emirates, Cameroon, Kenya, Netherlands, Sweden, Malaysia, South Africa, and Ireland. 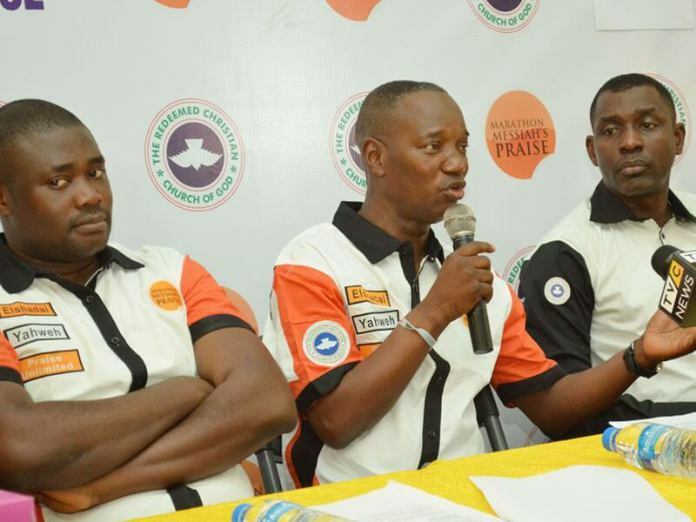 This is a giant step in our quest to bring Marathon Messiah’s Praise to the doorstep of every living being on the planet,” Pastor Ajayi said. He further explained 2018 MMP will be having two separate stages this year: Nigeria and Diaspora. The Nigerian stage will be at the Youth Centre, Redemption Camp, Nigeria, while the Diaspora will have 15 stages spread across the 15 participating countries outside Nigeria. The stage in Nigeria will host the 76 Hours of Praise and Worship non-stop while the stages in the Diaspora nations will share the 76 Hours among themselves and it will hold concurrently. This implies that there won’t be any stoppage on the Nigerian stage for 76 Hours non-stop. The Project Coordinator, Pastor Oluwafemi Oyetunde confirmed that MMP will not only feature international artistes but also expecting over 80 Nigerian worship ministers.